Dimitar Berbatov struck a spectacular hat-trick to steer Manchester United to a 3-2 win over Liverpool in the Premier League and former Old Trafford favourite Cristiano Ronaldo was on target for Real Madrid. Real notched up a 2-1 win at Real Sociedad while Barcelona's 2-1 triumph over Atletico Madrid was overshadowed by the sight of Argentine forward Lionel Messi being carried off the pitch on a stretcher after he suffered an ankle injury. Dimitar Berbatov scored a brilliant hat-trick as Manchester United beat Liverpool 3-2 in an Old Trafford thriller after a Steven Gerrard double had briefly threatened to earn an unexpected draw for the outplayed Merseysiders. United threw away a two-goal lead for the second week running but unlike last week's 3-3 draw at Everton they had time to find the winner, which Berbatov did six minutes from time. Chelsea made it five wins out of five with 21 goals scored and one conceded after beating Blackpool 4-0, all the goals coming in the first half through Florent Malouda (two) Didier Drogba and Salomon Kalou. Chelsea top the standings on 15 points, four clear of United and Arsenal, who drew 1-1 at Sunderland after a stoppage-time equaliser by Darren Bent for the hosts. Manchester City moved to fourth on eight points after beating Wigan Athletic 2-0 while Tottenham Hotspur, 3-1 comeback winners over Wolverhampton Wanderers, are fifth on eight points as last season's top-five finishers already now occupy the top five slots. Cristiano Ronaldo scored with a deflected free kick in the 74th minute to earn Real Madrid a battling 2-1 victory at promoted Real Sociedad. Argentina winger Angel Di Maria had put Real in front at the start of the second half with a curled strike only for Raul Tamudo to level from close range soon after. Champions Barcelona got their title bid back on track when Lionel Messi and Gerard Pique struck to lift the champions to a 2-1 win at Atletico Madrid. 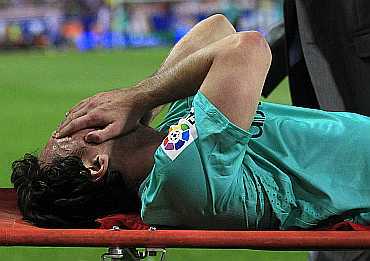 The victory was soured by an ankle injury to Messi, although initial indications suggested there was no bone damage and the Argentina had sprained a ligament. Leaders Valencia are the only team to have a perfect record of three wins out of three after they won 2-1 at promoted Hercules. Real and Sevilla, who beat Malaga 2-1, have seven points and Barca, Atletico, Villarreal and Espanyol all have six. 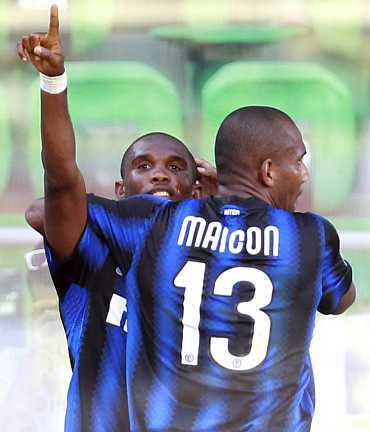 Inter Milan share the lead in Serie A with promoted Cesena after three matches. Last term's treble winners needed two Samuel Eto'o goals to come from behind and see off Palermo 2-1 in Sicily while Cesena beat Lecce 1-0 despite the referee wrongly sending off one of their players in the first half in a case of mistaken identity. Sampdoria could have shared the lead with a win but lost 2-1 at home to Napoli, who secured their first victory of the campaign after a flurry of late action. Juventus bounced back to form with a 4-0 win at Udinese but AC Milan's inconsistency continued with a 1-1 draw at home to Catania. Mainz continued their spectacular start of the season with their fourth straight win when they stunned hosts Werder Bremen 2-0. Thomas Tuchel's team is top on 12 points from four games, two ahead of Hoffenheim who had to settle for a 2-2 draw at Kaiserslautern. Champions Bayern Munich continued their rocky start to the season with a 0-0 draw against Cologne. Bayern, in ninth place with five points, have not scored in the league since their season opener on August 20. Schalke 04, runners-up last season, are in freefall after losing their fourth straight Bundesliga game. A 3-1 defeat by bitter rivals Borussia Dortmund 3-1 left them rooted to the bottom of the 18-team league. Olympique Lyon's terrible start to the season continued with a 2-0 defeat at Girondins Bordeaux, one week before they host leaders and arch-rivals St Etienne. Alou Diarra scored first with a header on the hour and Jussie added a second in stoppage time to give Bordeaux their second win of the season. Lyon, who lost Lisandro Lopez through injury and had playmaker and former Bordeaux player Yoann Gourcuff booed throughout, lie in 17th place, just one place above the relegation zone. St Etienne went top of the table for the first time since 1982 when a Dimitri Payet double and a goal by Emmanuel Riviere earned them a 3-0 home win against Montpellier. Champions Marseille made up for their midweek Champions League defeat by Spartak Moscow with a 3-0 win at promoted Arles-Avignon, who have yet to bag a point. Goals by Siem de Jong and Mounir El Hamdaoui earned Ajax Amsterdam a 2-1 win at arch-rivals Feyenoord which moved them to the top of the Dutch league with 16 points after six matches. PSV Eindhoven slipped to second, two points behind, after being held to a goalless draw by Roda JC Kerkrade, while champions Twente Enschede also played out a stalemate at neighbours Heracles Almelo. Champions Benfica, who had lost three of their four previous games, put their early-season woes behind them by beating rivals Sporting 2-0 at home in the Lisbon derby thanks to two goals by Oscar Cardozo. The Paraguay striker pounced on a loose ball after a corner to score on 13 minutes and added the second five minutes after halftime with a curling shot from outside the box. A goal by midfielder Maranhao earned second-placed Guimaraes a 1-0 home win over Leiria. Leaders Porto play away to Nacional in Madeira on Monday.